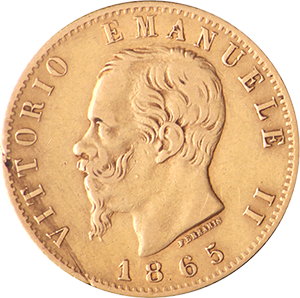 The 20 Lire Gold Coin was produced between the years of 1862 until 1927 and was the largest standard nomination for Italian currency of its era. Depending on the year the coin was produced, it’s purity ranges from 21.6 and 24 carats, making it among the purest fine gold coins of its era. Smaller nominations than 20 Lire in the latter years of The Kingdom of Italy era were made from copper, nickel and silver and some 20 lire coins were released in silver as gold became more expensive and scarce between and during the two world wars. The 20 Lire Gold Coin is often referred to as the Marengo (Marenghi as plural) and spanned the reigns of three separate Italian kings, King Vitorio Emanuele II who reigned from 1861 until 1878 and introduced the coin, King Umberto from 1878 until 1900 and Vitorio Emanuele III from 1900 until the end of the Italian monarchy after World War II in 1946. As such, there are three versions of the Marengo with the corresponding monarch on the coin’s obverse. 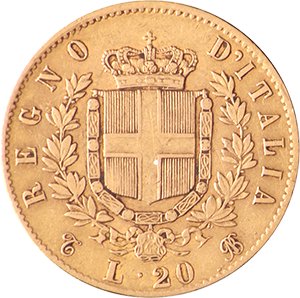 The coin’s inverse shows the House of Savoy’s (or Savoia) coat of arms, the Royal family that ruled Italy in the years the coin was produced. The coin’s gold content is 0.1867oz (5.8064g) and weighs 6.451g. It has a diameter of 21.20mm. As the coin is of such historical significance, for certain years the coin is of great value, such as the 1923 release, which is valued at over $1,000. For this reason, it pays to make sure that the coin is bought from a reputable source. Goldinvestments.co.uk is a world-renowned gold vendor with decades experience. We also offer advice on gold investment, storage and all things precious metal trading related from our office in London.